In my best succinct response I said “I specialise in emotions and their impact on people and performance.” Feeling quite proud of my 11 word response I was met with a reply that triggered an emotional response in me, the emotion in particular was anger, only mild anger, maybe more frustration and triggered all the same. Bearing in mind I am painting myself as someone that specialises in emotions it is good that a) I already aware that this is a trigger of mine and b) that I can manage my responses to choose an action that will harness the emotion in a productive (rather than destructive) way. One thing that is really important to me is taking every opportunity to increase awareness of emotions in general and/or their impacts on individuals. So I decided to seize this opportunity while it presented itself. I decided to go for the anthropological angle to begin with. The will to survive can be overcome by extreme sadness or despair and end in suicide. The drive to reproduce can be paralysed by fear meaning little or no intimacy. If we perceive the food presented to us to be disgusting we will starve instead of eating it. My yoga teacher made me move my mat away from the wall last week; she told me that our emotional being is bigger than our physical being and I needed space for both. When people say soft and fluffy, or touchy feely I ask them to explain what they mean, say a little more to me about that. Then they describe tenderness, affection, sadness, kindness, and then when they have named it, we can talk. I don’t know if I exist without emotions, what would I be? Hi Meg, thanks for the comment and I like the analogy that your Yoga teacher has used. Good idea to get others to name or explain what they mean by the phrase or saying. What are we without emotions, I will hold my response on that one as that is another topic in a series I am writing on the wonderful, amazing and powerful world of emotions. And I know there is more to it than that – an education system that values brains, logic, mental capacity over emotional intelligence, intuitive knowing or compassionate living. A culture that has previously been more about “stiff upper lip” than open, wholehearted, connected conversations … that. So there is a lot to overcome. Glad that you are standing forward and painting yourself as a person who specialises in emotion – we need a broader spectrum/ bigger rainbow of discourse in organisations to encourage new and different conversations – especially now in the light of rapid changes, new structures, destabilised companies. Thank you for the comment and hypothesis or theory, either is ok 😉 I agree that because they are already we may well give them less consideration and/or attention. I am soon to embark on a quest (with others I may add) to take the work we do on emotions into Schools, we are going to start with the teachers. The culture bit is an interesting one. I think there is starting to be a wider awareness and acceptance that emotions are important part of us that we need to invesitgate and understand more. It is this that has finally got me into the world of academia. I have always shunned it in the past and now am immersing myself whole heartedly. I am going to use my research and conclusions to further evidence the importance of emotions in our lives (that is the plan at least). Thank you for the compliment and completely agree we need a broader spectrum of conversations and approaches. It worries me that some people and/or organisations are having the same conversations now that they were 5-10 years ago. It needs moving on. The emotional impact of the change(s) that are all around us are MASSIVELY underestimated. Even in something as simple as a letter or communication it can be unconsciously laced with triggers for certain emotions. With some effort, planning and conscious effort we can be more aware of and choose better triggers and/or prepare for the emotional responses that follow. There certainly does seem to be some dare I say it, synergy between what we are working on. We can take this quest forward in our own ways and support each other too. Thank you so much for commenting and I am glad you enjoyed it. Great post and like you it grates on me when emotions are described as the soft and fluffy stuff. You see I really get the point about emotions overwhelming me. My mental health is a constant challenge and one that I don’t always win. I’m quite aware of how I show up in a room because (a) I’ve been forced to be and (b) I’ve done a lot of self analysis. So many people just pitch up and bring all kinds of emotions, hang ups, successes and disappointments in to the room. They have no filter and no awareness of what they bring. Hi Jon. Your journey over the last few weeks/months has been completely inspiring and I want to thank you for doing so. What you have done is bring an all too often taboo subject into conscious awareness and great conversations are happening as a result. I have been touched by mental health issues in my life and I can imagine how much bravery and courage it has taken to do what you have. Thank you. I do wonder how much the world would change if we drove up awareness in us as a species. The challenge is that to have awareness and/or filters means we need to reflect on what we do, how we feel, what causes things to happen and then decide what to do about it. All of this takes a lot of cognitive effort and time. If people ask me how I find time to tweet then saying that as well as tweeting, I take time each day to purposefully and deliberately reflect on emotional stuff may well short a fuse or two. On your challenge, I would very much like to discuss that over a beer. A blog here Jon? A great topic to share with a group – how they/we/show up in a room. You always make me think. If emotions were “soft and fluffy”, we wouldn’t have murder, or road rage, or crippling phobias. 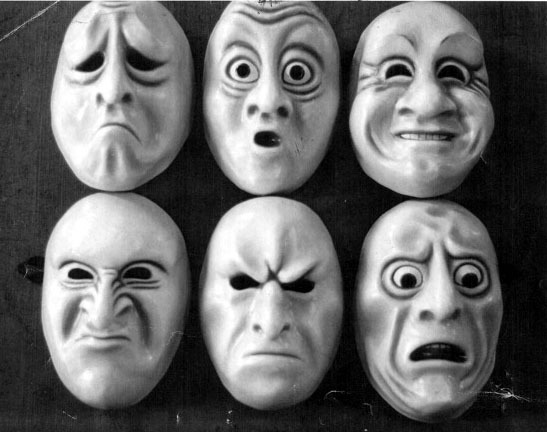 Emotions are horribly powerful, and we expend a LOT of energy attempting to manage them. I consider “touchy feely” to be different….largely insincere efforts at political correctness and illusion management rather than doing something useful. Hi Andrea. Thank you for the comment and you are right, there are some real destructive things called by emotions. At the same time, emotions do a lot of really constructive stuff too. Also, I agree that it does take a lot of energy to be aware of and then go on to manage them successfully. I wonder if soft and fluffy is used out of ignorance or maybe fear? Maybe facing up to our emotional selves is too scary so instead we make light of it by calling it names. Great article as always. It may well be the labelling of emotions as ‘soft and fluffy’ is just a means of mentally trying to minimise their impact, or to avoid the difficult discussions around how they impact on people. Personally I think that these are bigger than the ‘BIG’ issues of performance, knowledge and skills as they directly impact on behaviours, and are far more ingrained and difficult to change. Having an open mind to ideas that are different to our own requires that ability to be non-judgemental and to be aware of, but not ruled by, our emotions and how they may act as filters to ideas that are not in keeping wth our own values. Hi Duncan, thank you for the compliment and the comment! You are as insightful in words as you are in person. I agree they are more important than knowledge and skill as ultimately you can have all the skill in the world and if you cannot manage your emotions that will undermine everything else. Just look at what has happened recently with Lance Armstrong. Was it that his fear of failure or his chase for the elation of happiness or the sadness at the potential loss of his titles that led him to dope in the first place or to hide it thereafter? Just a hypothesis and at the same times again shows how emotion can overcome even knowledge and skill. Thanks again for the great comment!